This is part two of a three-part series on how to start trail running around Vancouver. In the previous post, we reviewed what trail running is all about, and some tips for getting started. In this post we’re going to look at some great trails to explore. They are split into three levels: easy, intermediate and pro. Easy trails will have relatively less elevation gain and less technical terrain. These trails are all at a low elevation, making them safely accessible year-round. They are also in areas where there are likely to be a fair number of other people around, areas that have cell-phone coverage and areas where its very hard to get truly lost. These trails all have easy access via car/bike/transit and are great trails to start out on for your first trail runs. The intermediate trails have more climbing and the trails will be more technical. This means the trails will be rooty, rocky and mostly single-track. These trails require more caution, as they will may take you into backcountry areas where you need to take safety seriously. The pro runs are not ones I recommend starting out with, but I wanted to list a few of the more adventurous trail runs you can do locally, so you can start to imagine the terrain that opens up to you once you have built up some endurance and trail running experience. So you’ve been tricked, er, encouraged into trying out some trail running. That’s great. But where should you go for your first few runs on these so-called trails? Here’s a handful of no-brainers. Everybody is familiar with running, walking, roller blading, or cycling around the Stanley Park sea wall. But relatively few people explore the trails within the park. Stanley Park covers 1,000 acres of land – that leaves a lot of terrain to be explored inside the outer concrete wall. Lost Lagoon and Beaver Lake are nice to run around, and there are many other connecting trails around the park. Most of them are very flat and wide, with the exception of the trails leading up to Prospect Point. There are also fountains and bathrooms (even concessions!) around the park, making this a great spot to get comfortable with trail running. (Trail info here). If 1,000 acres of forest isn’t enough for you to explore within the confines of an urban area, then you’re still in luck. Pacific Spirit Regional Park is about twice the size of Stanley Park and offers some spectacular trail running. The park is a nature reserve on the University Endowment Lands, and is prime area for a Sunday morning run. There is an impressive network of trails for you to zig-zag around until your heart’s content. Best of all, you can take a post-run rest at the beautiful Wreck Beach. (Trail info here). Ok, let’s move a little inland to the ‘burbs. 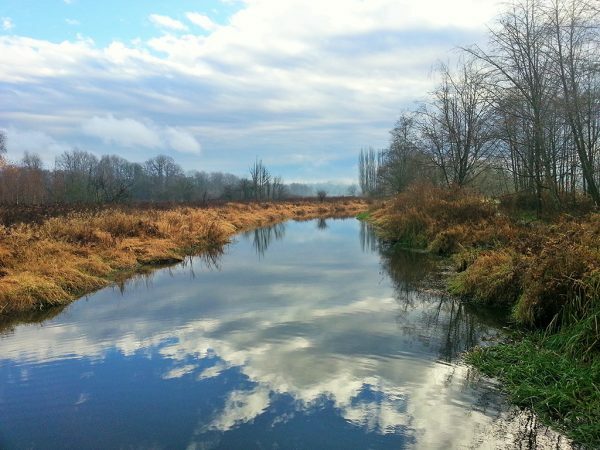 If you live in Burnaby or a nearby city, a great place to go for a run is Burnaby Lake. Unlike the more complex trail networks of Stanley Park or Pacific Spirit Regional Park, this run has only one option – a circular route around the lake. This gives you fewer options to add variety to your runs, but the good news is at about 10km, it is long enough to give you a solid workout (not to mention you can’t get lost!). The trail is flat and wide – trail running doesn’t get much easier than this. I have an affinity for this trail because it is close to my house and I can run to it from my front door. Also, one winter evening here I had a barred owl try to steal the toque right off the top of my head! How awesome is that? (Trail info here). North Van. There aren’t many easy trail runs here, but this is one of them. Rice Lake is a beautiful, quiet little lake in the Lower Seymour Conservation Reserve. Flat as a pancake and peaceful as a sleeping baby, this is one you can safely do solo and clear your mind. Each loop is only 3km and you cannot get lost if you stay on the main trail. (Trail info here and here). Okay, you’ve run around Stanley Park so many times you can’t stand the thought of having to fend off another squirrel attack. You’ve done more laps around Rice Lake than you care to admit, and your split around Burnaby Lake is so consistent you can predict your run down to the minute. Great! It’s time to step out of your comfort zone a bit and go exploring on some new terrain. Terrain with, gasp, hills! Roots, the horror! And even menacing rocks whose sole purpose seems to be to take your feet right out from under you. The following are trails that might take you out of cell-phone coverage, and that you would otherwise want to take the normal safety precautions on as if you were hiking (and possibly a GPS device like a SPOT or inReach). But this is where the fun begins. I don’t mean Golden Ears summit – that would be difficult -, I simply mean exploring some of the lower elevation trails. Golden Ears is one of my favorite Provincial Park camping spots, so its a great place to combine camping with some running. There are lots of trails, and there is a reason the 5 Peaks Trail Running Series kicks off its season here each year. (Trail info here). You can’t go wrong running in Lynn Headwaters, located in North Vancouver. The terrain is varied and slightly technical, but not crazy if you don’t stray too far from the parking lot. Great options are Lynn Loop (5km), Norvan Falls out-and-back (14km) or Lynn Peak if you want lots of climbing and a view (9km). In the quiet Village of Anmore (just north of Port Moody) sits Buntzen Lake. There are two options for running around the lake. The lower route directly around the lake is much easier and only about 8km. There is another route that takes you on the Sendero Diez Vistas trail which is more challenging and offers great views of the Indian Arm (15km). (Trial info for the lower Buntzen Lake route, and the upper Diez Vistas route). When I went to SFU I was completely oblivious to the intricate trail network that lines the steep walls of Burnaby Mountain. How naive I was. Burnaby Mountain is full of spectacular single and double-track trail with more than enough elevation gain to get your heart rate racing. This is another area where there are enough trails that that you can choose your own route based on how long you feel like running for. Mel’s trail is my personal favorite (running from north-to-south to maximize the amount of fast-paced downhill), and Velodrome trail is a wicked stair workout (with over 400 stairs). (Trail info here). You’ve been trail running for a while. You’re an experienced runner and can handle yourself in the backcountry. 6+ hours of continuous, strenuous exercise doesn’t scare you in the least. And you’re in the mood for some pain. Now we’re talking. This route also starts in the Lynn Headwaters Regional Park, but rather than running to Norvan Falls and turning back, you can carry on into Hanes Valley. After a grueling scramble up a scree slope, you can either summit Crown Mountain, or head directly for Dam Mountain and then the Grouse Mountain Chalet. If you don’t want to drop a second car at the Grouse Mountain parking lot, you can even run all the way down Old Mountain Highway back to your original starting point. Making for an epic, 30km loop. (Trail info here, and here.). One of the most stunning point-to-point routes you can do locally, this run starts at Cypress Bowl and takes you all the way to Porteau Cove. In between you’ll pass several scenic spots including St. Marks Summit, The Lions and Deeks Lake to name a few. And not to mention you’ll have views of the magnificent Howe Sound most of the trip. It’s 30km of grueling terrain, but the ultimate Vancouver mountain experience. (Trail info here). That should give you an idea of some great places to stretch your legs out, but you’ll likely find your own favorite spots to run. If the above list isn’t enough for you, the City of Vancouver has a list of jogging trails here (but a lot of them are very short at under 1km). Karl Woll, born and raised in Vancouver’s Lower Mainland, has been passionately exploring the area’s local mountains over the last decade. Beyond hiking, Karl fulfills his desire to be in the outdoors by kayaking, cycling, scuba diving, snowboarding, and most frequently, trail running. He blogs at Outdoor Vancouver and is the author of The Great Hikes of Vancouver eBook. That is a pretty epic route Luke! Especially to tackle solo, well done! I’ll file that one under Pro+. Thanks for this information Karl. I have a question though. There’s a pretty massive jump in the commitment and time required in your intermediate to pro suggestions. My stamina and wants lie between Lynn Valley trails and Knee Knacker endurance. I’ve been enjoying the north shore trails (BP, BCMC etc) but keeping my runs in the 1.5 – 2 hour range. I like the rugged and technical runs, but can’t handle the Haines or Crest trail yet for my weekend jaunts. Any suggestions on non BP technical routes in that 12-15 km range on the North Shore? Hanes Valley, if you exit at the Grouse Chalet and don’t do Crown Mountain is totally doable though. (Just wait another month or two for the snow to melt and the stream crossings to be passable). I think its closer to 20km that way. It’ll hurt but you won’t regret it, and you’ll push yourself do a new distance. Do it with some friends and take your time to enjoy it! great ideas Karl. These are a little more attainable, and all sound like single track bliss. I’d hesitated to join in on the KK training runs, but that’s probably just what I need to extend myself. The KK groups have a solid turnout and you can almost always find a few people that run your same pace. Its a pretty casual group (for the most part). I’ll most likely be there this Sunday. Either way, hope the suggestions work out for you! thanks again. i’m doing the 5 peaks up at Alice Lake this weekend and if that doesn’t humble me so much that i give up running, I may try for the following weekend on the KK groups. Ryan how did you find Alice Lake? It’s my first try at 5 Peaks this year and I was pretty humbled Saturday so figuring out my next steps for training! Dear all – I am a Danish trail runner coming to Vancouver in September. I wonder if there are local people to join on their running endeavors into the wild?